The offerings join a growing pool of interconnected devices that are expected to see rapid adoption in the years ahead. The product line refresh includes a new live-streaming security camera, an updated version of its smoke and carbon monoxide detector, fresh features for its thermostat and a brand-new app. Nest Cam, Nest’s new pocket-size security camera, offers high-definition video quality, motion alerts and night vision. Users can see live video captured by the camera on a smartphone. Nest Protect, the second iteration of Nest’s smoke and carbon monoxide detector, can use two wavelengths of light to sense different types of fires. It also lets users silence an alarm from a smartphone. Nest’s flagship product, the Nest Learning Thermostat, now notifies customers when pipes may freeze and integrates with other Nest products. The thermostat adjusts temperature based on a user’s habits and can be controlled from a smartphone. The new version of the Nest app lets consumers control all three Nest products from one place. The new Nest Protect product. Nest’s vision is to create a “thoughtful home” that “takes care of itself and the people in it,” said Nest CEO Tony Fadell in a statement. Five years after Nest’s launch, Fadell said all the pieces are now in place for the company to achieve that goal. 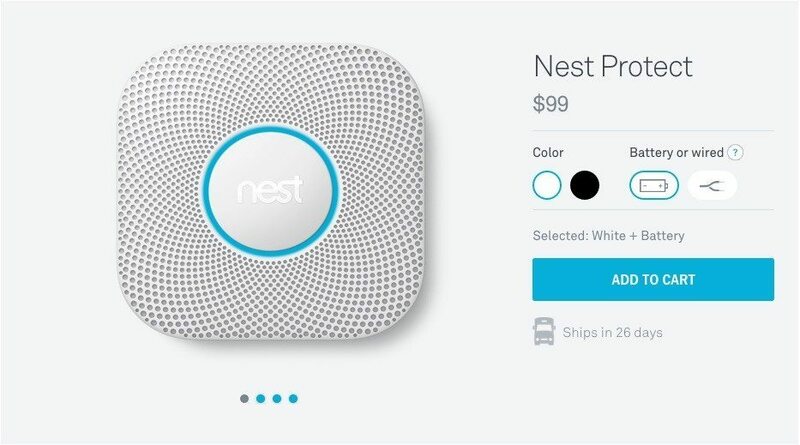 More than 9,000 developer partners are using the Works with Nest developer program to connect Nest products with everything from washers and dryers to cars, he said. Connected-home device shipments will grow at a compound annual rate of 67 percent over the next five years to hit 1.8 billion in 2019, accounting for about a quarter of all “Internet of Things” shipments, according to a BI Intelligence report. The Internet of Things refers to a network of devices connected to each other through the Internet. Home energy equipment and safety and security systems, such as the smart thermostats and smoke detectors offered by Nest, will become popular first, paving the way for adoption of other interconnected devices, according to the report.